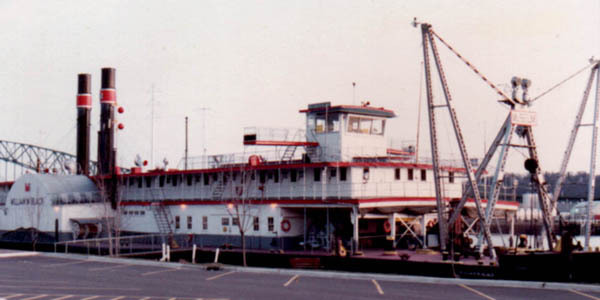 This is a 1983 photo of the William M. Black, taken by Roger Thiede, docent for the Dubuque, Iowa County Historical Society. It was used to complete the navigable channel on the Missouri River, making it possible to use the river for shipping wartime supplies during World War II. Roger Thiede reports: "You would not believe how many person hours (all man hours so far) we've spent working on various pieces of the boat and how many more we will spend before the dream becomes reality. Don't even ask about how much money we've spent. I don't know and I don't think I want to know." It's a labor of love, apparently, but we at Steamboats.com bet that it will all be worth it. We will report updates as the project progresses. ~eds.